Please see the Leeds Council school governor support page for more information on becoming a governor. Pay Review committee – responsible for ensuring the implementation of the school Pay Policy and Teacher Appraisal Policy. Pay Appeal committee – responsible for hearing pay appeals and ensuring a fair and proper process has been followed. Current and recent (in the last 12 months) governors and business/other interests declared are provided in the table below. Governors and associate members, if appointed, are reminded that they should declare any changes as and when they occur. All of our Governors were appointed by the Governing Body. Governor photographs are included with those of the staff in school’s reception area on the photo board if you’d like to know who we are! Each governor has a term of office of four years. 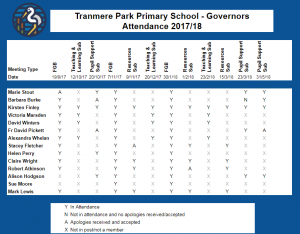 The following is an attendance record for individual governors at meetings of the full governing body and committees. Please click to enlarge. The headteacher is responsible for day-to-day leadership and management of the school. The role of the Governing Body is to provide strategic direction and act as a “critical friend,” supporting the work of the headteacher and other staff. School has a delegated budget to cover salaries, running costs, maintenance and equipment; the Governing Body is responsible for managing this budget, for example, they can decide, with the help of the head, how many and what type of staff to employ, which equipment to upgrade or replace and what the priorities are for implementing new strategies and initiatives. Governors must also appoint the head and are involved in the appointment of other staff. In addition, the Governing Body has a role in monitoring school’s progress, and in setting annual targets for school’s performance. 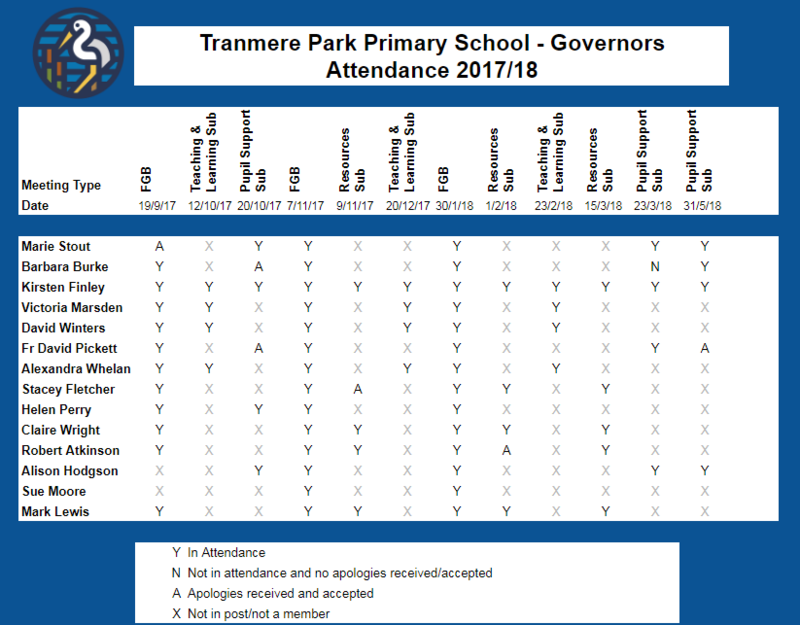 Governors are available for parents to talk to on Parent Consultation evenings. Come and have a chat! 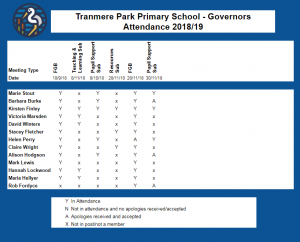 There is also a Performance Management and Pay Sub Committee which reviews the Headteacher’s Performance annually and makes any pay decisions. The Governing Body sets out the behaviour principles statement annually. Our Arts and Humanities Teams have now presented to Governors about both the opportunities offered to children, and developments in, their subjects. It was great to hear that in addition to our pupils doing really well in their core subjects, they are also being offered fantastic opportunities across the wider curriculum. 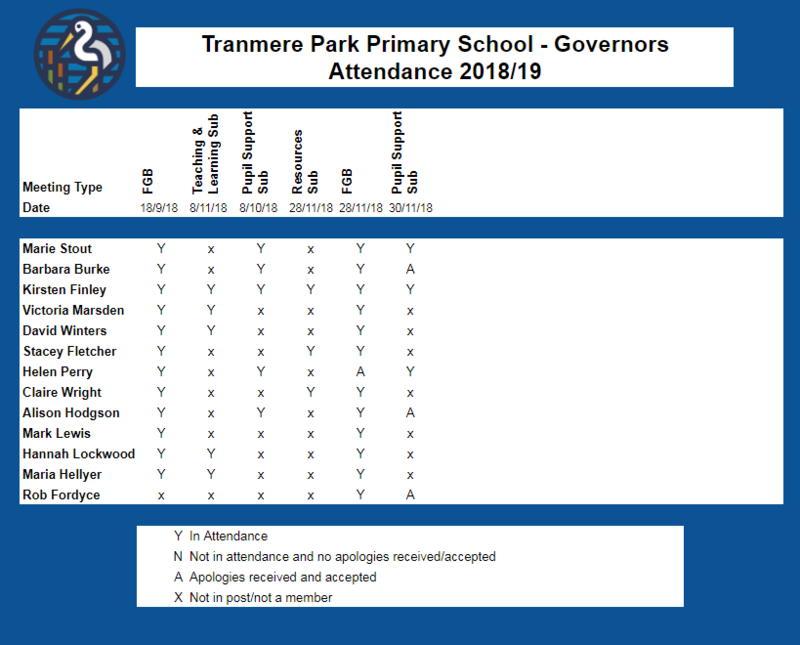 Tranmere will hopefully be revalidated for Artsmark Gold this year and is well on the way to achieving the Gold level of the Sainsburys School Games Mark. A huge thank you to the staff for organising such a fantastic level of provision for the children. Teaching, Learning and Curriculum Sub Committee. Each Governor also takes responsibility for a specific area and undertakes class visits. Parents should contact class teachers or the headteacher in the first instance. However, the Governing Body can be contacted via the school office during term time. If you would like information on how to become a governor please visit the Leeds Council school governor support page.